CHESTER — Former NFL player Ron McDole will hold a book signing on Saturday as part of the Meigs Heritage Festival at the Chester Courthouse. McDole, who was born in Chester in 1939, moved to Toldeo in 1944. He spent 18 years playing in the National Football League, including eight seasons each with the Buffalo Bills and the Washington Redskins. McDole, along with Rob Morris, authored the book “The Dancing Bear: My Eighteen Years in the Trenches of the AFL and NFL” earlier this year. The book signing will take place on Saturday at the Chester Courthouse from 9 a.m. to 3 p.m. According to his biography on ronmcdole.com, from the early 60s to the late 70s, defensive end Ron McDole experienced football’s golden age from inside his old school, two bar helmet. 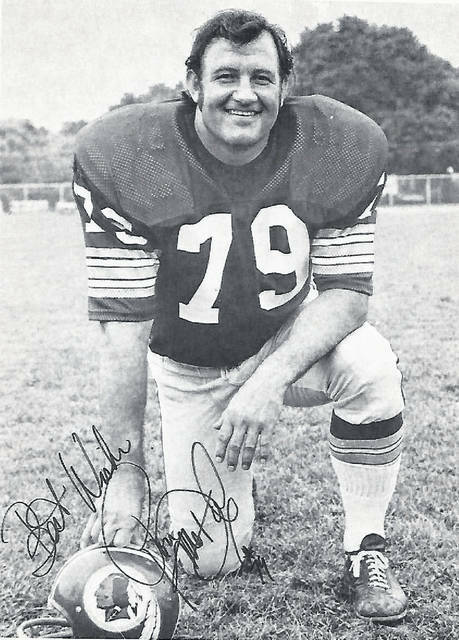 During an 18 year pro career, McDole nicknamed The Dancing Bear played in over 250 games, including two AFL Championships with the Buffalo Bills and one NFL Championship with the Washington Redskins. A cagey and deceptively agile athlete, McDole wreaked havoc on football’s best offenses as part of a Bills defensive line that held opponents without a rushing touchdown for 17 straight games. His 12 interceptions remain a pro record for defensive ends. Traded by the Bills in 1970, he was given new life in Washington as one of the most famous members of George Allen’s game smart veterans known as “The Over the Hill Gang.” Through it all, McDole was known and loved by teammates and foes alike for his knowledge and skill on the field and his ability to have fun off it. In his book The Dancing Bear, McDole the storyteller traces his life from his humble beginnings in Toledo, Ohio, to his four years at the University of Nebraska, his marriage to high school sweetheart Paula, and his long, accomplished professional career. He recounts the days when a pro football player needed an off-season job to pay the bills and teams had to drive around in buses to find a city park in which to practice. The old AFL and NFL blitz back to life through McDole’s straightforward stories of time when the game was played more for love and glory than for money. In addition to the book signing, the Meigs Heritage Festival will feature a car show, pie contest and auction, courthouse tours and many activities for those of all ages. A portion of the information from ronmcdole.com.